Up until now, the quest to find the perfect emerald cut diamond has been long and tedious with many pitfalls to avoid. In this way, looking for a stunning emerald cut diamond engagement ring was similar to the quest of a mythological hero, who set out to slay a dragon and win the admiration of his emerald and her court in doing so. However, riding off into the sunset to slay that dragon, might have been easier than trying to find an emerald cut diamond that exhibits exceptional light performance. Because at least the dragon slayer knew the unseen dangers, and hopefully had the experience and training to stand a chance. Whereas most people who set off to buy an emerald cut diamond, probably don’t have the benefit of experience or professional insight. Perhaps this is why so many people turn to the world wide web of conflicting advice, where they can compare the specifications of emerald cut diamonds with ease in the comfort of their own space. Is GIA Excellent really good enough? Is there an AGS Ideal-0 grade for emerald cut diamonds? What are the best proportions for emerald cut diamonds? Are ASET/Ideal Scope images useful for emerald cuts? Where is the best place to buy emerald cut diamonds? And who can you trust, when everybody says that their emerald cut diamonds are the best? Many people have shared their tale of woe and frustrations with us throughout the years, telling us how difficult it was to find a truly spectacular looking emerald cut diamond. Of course, we could appreciate their experience, because it was difficult for us to find an exceptional emerald cut diamond, even with our extensive knowledge and trade contacts. If you’re looking for an emerald cut diamonds, perhaps you’ve observed the lack of information available for them. The GIA Laboratory does not provide crown or pavilion measurements for fancy shape diamonds. Nor are very many vendors providing ASET Scope or Ideal Scope images for emerald cut diamonds and other fancy shapes, because the majority are rarely if ever cut for light performance. That is until now, because Brian Gavin, the Wizard of Diamond Cutting, has slain the Emerald Dragon and cut it superbly as near the edge of perfection as possible. In doing so, Brian Gavin altered the course of history, as we now have a brighter perspective of light performance. Interestingly enough, up until this moment right now, it wasn't likely that you'd see the words emerald cut diamond light performance in the same sentence. In accomplishing this feat, Brian Gavin has made it much easier for you to look like a hero. Not only can you fulfill her wish for an emerald cut diamond, but you can also rest assured that it looks spectacular. Brian Gavin Signature Emerald Cut Diamonds are Brighter! The problem with most emerald cut diamonds is that they aren’t very bright or lively. The traditional step facet design does not produce the same sparkle as a round, so brightness is a critical factor of light performance. The reality is that most emerald cut diamonds just sit there on her finger taking up space, but can't deliver the bright outlook that she's dreamed about her whole life. Up until now, most of the emerald cut diamonds that you’ve seen, probably look more like the beveled glass on a coffee table. They look dull and lifeless, but there didn’t seem to be a better alternative in that shape. Lucky for you, Brian Gavin Signature Emerald cut diamonds offer the light performance that you desire. They perform better than traditional emerald cut diamonds and face-up brighter with better contrast brilliance. Brian Gavin Signature Emerald cut diamonds face-up brighter because they’ve been re-engineered from the ground up with superior light performance in mind. 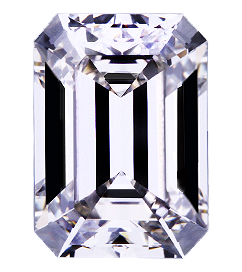 Critics of Brian Gavin will likely say that he did not invent the emerald cut diamond. That’s true, we certainly can’t argue that, nor are we trying to imply that Brian Gavin is the inventor of the emerald cut diamond. We’re merely saying that he created a better one, which delivers next-generation light performance. Brian Gavin Signature emerald cut diamonds represent the next step in the evolution of diamond cutting that reflects the brilliance of its creator. To that regard, Henry Ford did not invent the automobile, on the contrary, he created more efficient manufacturing methods and design elements that we still benefit from today. In the same spirit, Brian Gavin is perfecting the art of creating a better looking, brighter emerald cut diamond, in a manner that is consistent and commercially viable. At the same time, we’re not blindly claiming that Brian Gavin Signature Emerald cut diamonds are brighter than the rest. We’re backing it up with proof provided by Angular Spectrum Evaluation Technology (ASET) via the Light Performance grading platform of the American Gem Society Laboratory. One look at the ASET images of these four emerald cut diamonds, and you know that the one on the left is brighter and better looking. After all, the colors are bolder, brighter, and distributed more evenly, right? It doesn’t exactly take a rocket scientist to figure that out. The American Gem Society Laboratory developed Angular Spectrum Evaluation Technology (ASET) to enable you to quickly and easily determine which diamond exhibits better light performance. As you can see, that’s pretty easy to figure out, but you might be wondering about the principle behind ASET, and what each of those colors represent. ASET is designed upon the principle that we live in a world that is illuminated along the path of a hemisphere, which represents the sky. Depending on your position in relationship to the sun, the light which illuminates our lives will be brighter, or less intense, and create shadows. With that in mind, tell me what is brighter: The intensity of light at sunrise, sunset, or mid-day? You might be inclined to say mid-day, because that is when the sun feels hotter. However, keep in mind that we’re located about the same relative distance from the sun at all times of the day. Therefore, what affects our interpretation of that light, has more to do with the direction the light is coming from, and the contrast created by the shadows. This is what enables us to see depth of field, and appreciate the subtle differences created by different intensities of light. Click here to discover how you can use ASET Scope to select a brighter, better-looking emerald cut diamond. The two factors that dictate the light performance of an emerald cut diamond are brightness and contrast. 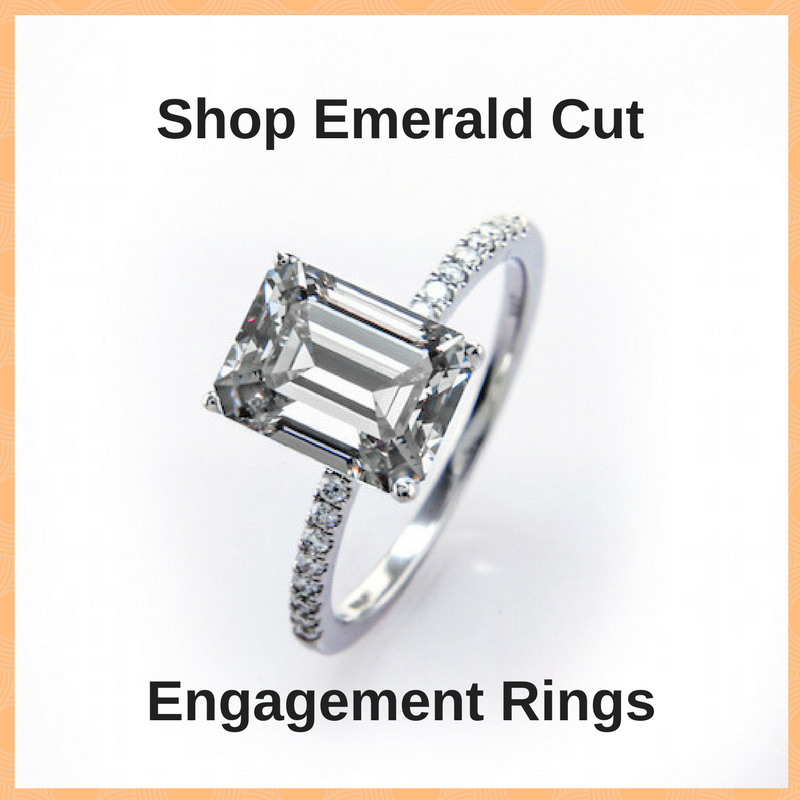 Very few people understand the importance of these visual properties when selecting an emerald cut. People tend to focus on total depth, table diameter, and length to width ratio. However extensive research and development conducted by Brian Gavin reveal that facet structure is also a critical factor. While the facet structure of an emerald cut diamond might seem simple at first glance, it turns out that getting the light to reflect off those facets harmoniously is a complex endeavor. The long facets of an emerald cut diamond have to be incredibly straight, which is very difficult to achieve. One of the most challenging parts of diamond cutting is polishing parallel lines. As you might expect, the proportions of the diamond also have to be just right to maximize light return. There is very little tolerance within the range of proportions that produce spectacular performance. Even the slightest variation from “the magic zone” has dramatic effects on light performance. A difference as minuscule as three-quarters of a degree will dramatically alter the way light reflects throughout an emerald cut diamond. Which is something that quickly became apparent, as the prototypes for the new Brian Gavin Signature Emerald cut diamond came off the polishing wheel. Thankfully, these are all critical factors that Brian was able to overcome in the development of the new Brian Gavin Signature Emerald cut diamond. Polishing the facets of an emerald cut diamond with greater precision and focusing on the right proportions improves light performance dramatically. However, there is always room for further improvement which is why Brian Gavin preceded to reverse engineer the facet structure. The majority of emerald cut diamonds you'll see feature 4 step facets on the pavilion, which enables the diamond cutter to retain more carat weight. Greater total depth is necessary to polish four step facets on to the diamond. The downside is that thickness is relative to diameter. The more carat weight the diamond cutter hides in total depth, the smaller that rock looks on your finger. Balancing light performance while maximizing visible diameter was at the forefront of Brian's mind while he was redesigning the emerald cut diamond. 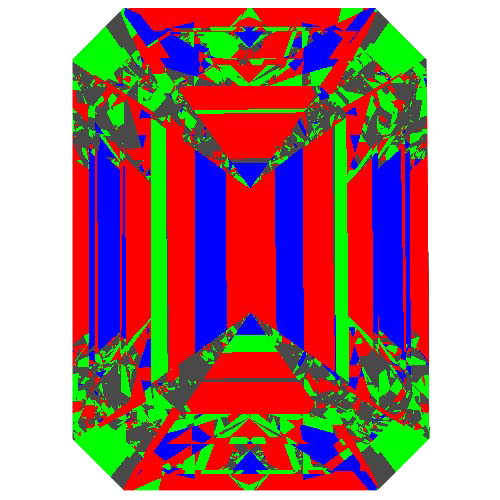 One of the thoughts at the forefront of Brian’s mind when he was creating a brighter emerald cut, was to see whether he could also make one that faced-up larger. While Brian's research made great strides towards improving the look of traditional 4-tier emerald cut diamonds, they still didn't offer the symphony of brilliance that envisioned. Thus, Brian kept fine-tuning the elements of diamond design. One of the benefits of being a 5th generation diamond cutter is being able to call upon all those years of collective experience. With that in mind, Brian Gavin sat down with the journals kept by his father and grandfather. Brian spent days, scouring the pages of those journals, looking for hints on how to improve the emerald cut diamond. It was within those pages that Brian found the glimmer of inspiration which will change how we look at emerald cut diamonds forever. It turns out that those old-world diamond cutters didn’t produce 4-tier emerald cut diamonds like the ones we see today. Instead, they relied upon a 3-tier facet structure. The crescendo of light created by the combination of design improvements, incredible skill, and the right proportions, delivers a perfect symphony of brilliance in an emerald cut diamond which is so unique and breathtaking that the process is patent pending. You’ll understand why the first time you feast your eyes on a Brian Gavin Signature Emerald cut diamond.